Let’s think of what would happen if, while heading North on a jungle trail, you’re forced to quickly stop because you’ve come upon an unexpected 8-way intersection in the trail. Naturally, you look down at your compass for guidance to decide which trail is the correct one to follow. Now, anyone who is familiar with a compass knows that if you are moving quickly and come to a sudden stop while at the same time trying to get a compass reading, it won’t work. From the sudden stop in movement, the compass needle will be swinging back and forth for a few moments, first to one side and then the other. And so when you quickly stopped for the unexpected intersection on the jungle trail, this is what happens. 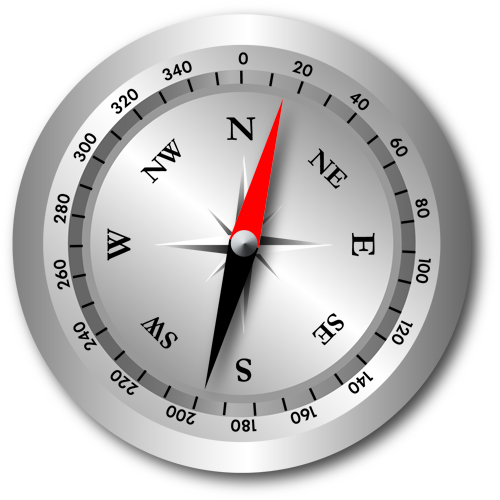 Your compass needle begins to swing back and forth, first pointing at your left hand, and then wildly swinging back to point at your right. But of course, you’re trying to decide which way is truly north while the needle is performing these crazy antics. What happens if you’re too impatient to wait and quickly choose the direction off to your left as being north because you think it “feels right”? If you adjust your course based on this, what have you done? Possibly headed off in the wrong direction, that’s what! Why? Because if you choose, you lose! In Psalm 32, what is the author (King David) talking about?!? Had David never read of God’s justice in Deuteronomy? How can one’s sin be “covered”? How can justice be maintained if the Lord simply “forgives”? Sin is a crime against God’s law, and payment must be made for crimes if justice is to be maintained! In the courthouse of your local town, a judge would lose his job if he simply started forgiving people of their crimes because he loved them and wanted to bless them. He would be charged with being an unjust judge. Do we dare think that the Holy Judge of all the Earth can be unjust? Of course not!! We even have His justice clearly taught in our passages from Deuteronomy and Proverbs. He is and will forever be, just! On the surface, these passages create a disturbing dilemma. Was David truly forgiven, or was he delusional? If he was forgiven, was God’s justice maintained? If so, how? To simply choose one of these teachings and disregard the other (or file it in the “unknowable mystery” department) would be to embrace a partial or false teaching. If we choose one teaching over the other, we lose. We don’t want to (as many do) simply embrace the fact that God forgives, and in doing so unwittingly portray Him to others as unjust. Nor should we insist that as a just God He demands works as a form of payment for sin, or that all must be sent to Hell for justice to be maintained. These views (or any other compromises) would rob us and others of one of greatest and most foundational teachings in Scripture…that a just God can forgive guilty men, because Christ paid for the crimes of His people on the Cross. Through His death, punishment was handed down by the court (so justice was maintained) and so also was forgiveness made available to the ones who are guilty (you and I). This shedding of blood by Christ as He paid for our crimes is called atonement. Now, obviously, the atonement of Christ isn’t taught in any of these example passages and it takes some digging elsewhere to find just how it works and how justice and forgiveness can coexist. But holding fast to the choose/lose rule forces us into doing the necessary digging, and by doing so our eyes are opened to the most incredible story ever told & the truth of our Father’s love. The point is this – When confronted with troubling passages that make you feel as though you must choose…don’t! If you choose ­- you lose (in this case, you would have lost the gospel itself). It is “choosing” that has created so many of the great doctrinal debates and divisions in church history. Many, many of the arguments found between church denominations would cause far less trouble if both sides had a gritty determination to avoid choosing and instead accept on faith what all passages teach (I know that the proponents on both sides of the age-old debates would insist they don’t choose, but when their arguments are examined, this is rarely found to be the case). Don’t choose. Instead, go dig! Struggle through, research, and question the text. When it comes to digging, it would be wise to have a sound commentary on hand. Myself, I would recommend Matthew Henry’s Commentary as it’s affordable and well written. The great preacher Charles Spurgeon once stated that if he were only allowed two books on his shelf, one would be the Bible and the other would be Matthew Henry’s Commentary. It’s that good! if you choose – you lose. Don’t choose…dig! Wow! What incredibly good news! We sinful men are forgiven by a holy, loving God who is also just. Our God is truly worth bragging about!! I have heard it said by modern teachers that instead of trying to grasp truth as though it were absolute and set in stone, we should instead embrace the mystery that is God. This line of thought suggests that it’s arrogant if we, as tiny and finite creatures, say that we can know truth or are able to understand God. Let me submit to you that while sounding humble, this is a low and insulting view of God! Is our all-powerful creator so inept that when He wants to teach us something, He cannot find the words? Is He incompetent and unable to teach those He desires to teach? Did He create creatures with the plan of instructing them but somehow forget to give them the ability to understand His instruction? Is His handiwork so pathetic? NO!! Our Lord has given us the ability to understand, the written Word to teach us and our mouths so that we might proclaim the truth to others. It is true we are unable to grasp all understanding of all that God is. He is too eternal, too deep, and too magnificent for that! But we can fully grasp all that He intends for us to grasp, as He had the forethought to give us that ability. Remember this when reading and studying Scripture. Also remember that our Lord used specific words when writing Scripture (through the hands of men) and He chose those specific words for a reason. Any time the words are changed, modified or redefined, the truth as set forth by God is altered and lost. We must walk with great fear and respect when we read or teach the Bible. The Scriptures are an accurate and historical claim to truth (absolute truth) and any alteration or dismissal of its’ teachings means we are actually challenging & correcting God Himself! In Conclusion, I can only beg of you to keep in mind the simple tips (or rules-of-the-road) of Biblical study that you have just read. Remember to G.U.A.R.D. yourself from the false teachings of others as well as your own false understanding as you study alone. In the same way you must understand a GPS, map or compass in order to navigate unfamiliar territory, the “biblical compass” must be understood, calibrated and used correctly in order for you to get anywhere at all in your Biblical studies. The Bible is an incredibly deep, intricate and beautiful book filled with revealed truth from our creator. Any attempt to read it in a flippant, self-centered or reckless fashion may result in disaster! It’s my prayer that all of you reading this will apply what you have read and that through a better understanding of the written Word you will draw closer to God and bring him the glory due for the things that He has done.